A 60 litre fish tank is an ideal size to keep a small group of 7 – 8 Betta females. Betta’s are better (pardon the pun) known as Siamese fighting fish and more than one male cannot be put in a tank, as like the name suggests they will fight. You can however put females together and although they may tussle for dominance in the tank they will not actually fight. Caring for the Betta female is fairly easy and they are pretty peaceful. They like a water temperature of 75 – 86 degrees Fahrenheit which is similar to that of the place of their origin, Thailand. They grow up to a maximum of around 3 inch and come in assorted colours such as blue, red, gold and purple. They are never as vibrant as the male Betta and do not have the glorious fins and tail but they are still attractive. As a carnivore they like to eat bloodworm and brine shrimp but may eat a quality flake food as well. Be careful that you do not put anything to small in the tank with the Betta females, such as bottom feeding shrimp etcetera, as they may eat them. When adding the Betta into a tank only place around three at a time and allow them time to form their hierarchy before adding the others. It will also help if you give them plants, rocks and ornaments to hide in away from the others. They are also very playful and like floating plants playing in the bubbles of an air stone. 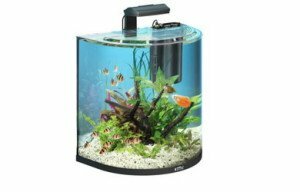 A 64 litre fish tank is a great size that gives you plenty of options with not too much work involved once everything has been set up. Your new aquarium can brighten up your room and looks great in either a corner or the center of the room.